It has been a hot summer so far in Canada, and this season’s Short Film Face Off on CBC definitely played a part in the rising heat levels. For the past three weeks, fans of Canadian short films tuned in to the program and witnessed nine sizzling filmmakers burn their way up the points scale for a chance to win a $45,000 film production prize generously sponsored by Telefilm Canada and William F. White International. 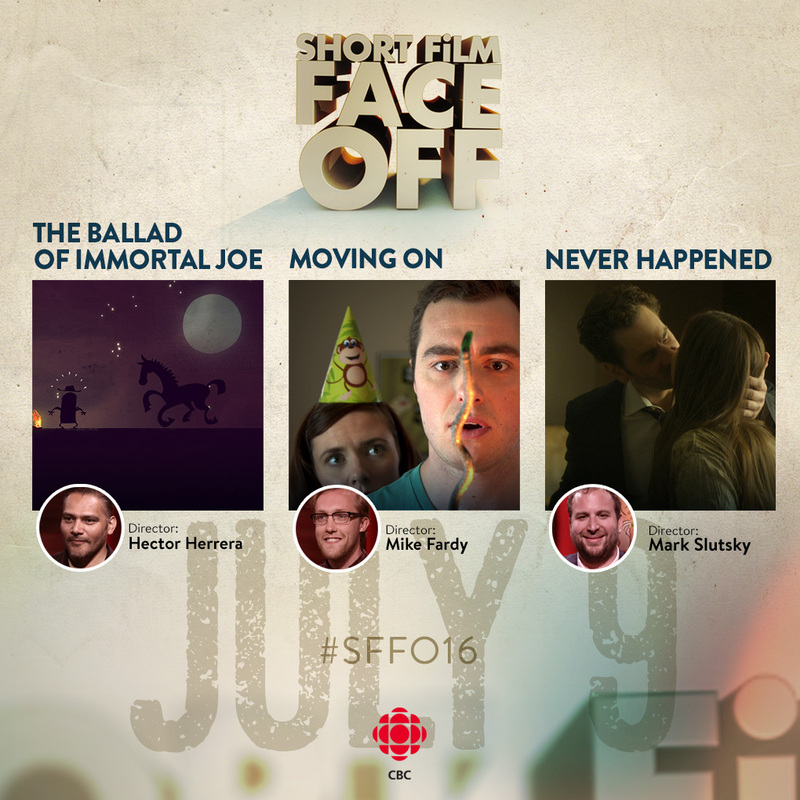 This season’s fourth and final episode of Short Film Face Off began with the re-introduction of the three finalists: Mark Slutsky (Never Happened), Mike Fardy (Moving On) and Hector Herrera (The Ballad of Immortal Joe). All three films were re-screened for the viewers and studio audience, the directors spoke briefly about the production of their films, and panelists Mohit Rajhans, Nadia Litz and Eli Glasner shared their parting comments to Mark, Mike and Hector. Three alumni of Short Film Face Off were also featured in small interview clips throughout the show. James Stewart, Stephen Dunn and Ashley McKenzie let the audience know about what new projects they were working on and how appearing on Short Film Face Off was a boon to their filmmaking careers. Last year’s Short Film Face Off winners BJ Verot and Brad Crawford were also interviewed and shared the exciting news that one of their recent film projects had made it all the way to Cannes. Viewers from coast to coast had the opportunity last weekend to vote for their favourite film and the ultimate winner of the $45,000 prize. To present the award to the winner, Francesca Accinelli, Telefilm Canada’s Director of National Promotion & Communications, joined host Steve Patterson to make the exciting announcement. In the end, this season’s winner was Mike Fardy! Congratulations, Mike! Kudos also goes out to Mark and Hector for making it to the final round. You can catch tonight’s season finale, the three previous episodes and all nine shorts at CBC Player. This season’s Short Film Face Off had an excellent variety of professionally-crafted shorts produced by filmmakers from across the country. It is good to have a program like Short Film Face Off available to Canadian audiences. Not only is it an unique platform Canadian filmmakers to be seen and to get a boost in their careers, it also gives fans and admirers of the genre access to a vast array of shorts that they may not otherwise get a chance to see. The show’s intimate format brings the audience and producer closer together and having the films accessible on the website makes it easier for fans to find them and to watch them again and again. Next year is Short Film Face Off’s 10th anniversary. It will be interesting to see which films will be featured and if any special events will take place around its milestone year. Maybe some special award will be handed out on the show, such as a People’s Choice Award or a 10th Anniversary Award for an alumnus of the program. Looking forward to Season Ten!